As of this afternoon on Tuesday 18 December, 163 ARC boats have safely crossed the finish line into Rodney Bay Saint Lucia after their Atlantic crossing from the Canary Islands. This steady inflow made the Rodney Bay Marina a constant hive of activity with 20-30 arrivals each day at the end of last week, keeping the welcome team from World Cruising Club and the Events Company of Saint Lucia busy all hours of the day and night. The activity on the docks steadily increased as more people touch down in Rodney Bay Marina - busy spots have included the Boardwalk Bar for some much craved Caribbean refreshment, the laundry service, the shower block and the numerous sailor friendly cafes for some needed WiFi. Once these ‘essentials’ have been achieved, and the buzz of a few arrival drinks have worn off, crews have been venturing out to see some of Saint Lucia leaving the pontoons of Rodney Bay strangely quiet in contrast to the continuous waves of arrivals. There’s a myriad of options for ARC crews to find their land-legs around the island. From beautiful beaches, stunning lush rain forests, rustic bars and cafes and opportunities for diving and kite-surfing, arriving in Saint Lucia is the perfect introduction to the Caribbean and a worthy reward for crossing the ocean to get there. 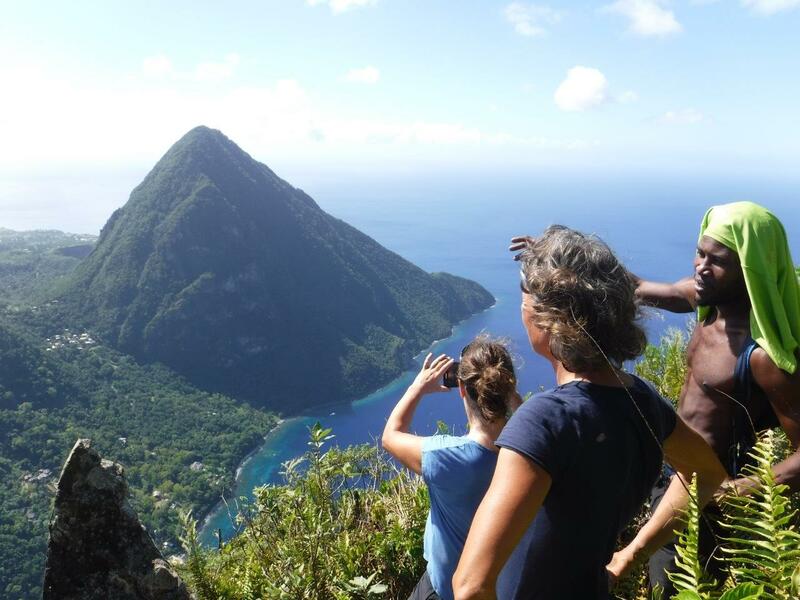 The island’s signature landmark, The Pitons, has been one of the most popular attractions adventure-seeking crew members. Located just south of the town of Soufriere on the west coast, Gros Piton (771 m / 2,619 ft) and Petit Piton (743 m / 2,461 ft) were created less than a million years ago by volcanic activity, which still can be witnessed at the Sulphur Springs volcano located nearby. Climbing Gros Piton takes about four hours and anyone with reasonably good physical fitness can handle the climb. Leaving Rodney Bay first thing in the morning for the two-hour drive south is recommended and crews have been finding the excursion an excellent way to stretch their legs after two and a half weeks at sea. The trail begins in the quaint countryside village of Fond Gen Libres; proud and friendly young persons from the village serve as guides. For those keener to enjoy truly scenic tranquillity, you’d be hard pushed to beat the relaxed ambience of Marigot Bay which has been a popular place for ARC+ yachts and early ARC arrivals to visit over the weekend. Nestled in the lush green hillsides, the Marina recently completed a full upgrade, and the stunning five-star hotel resort offers ARC participants a 35% discount on room rates until 23rd December. Closer to Rodney Bay, the island’s capital Castries with its covered market of crafts and local produce is also a really interesting place to visit and convenient to reach by local busses. Castries is also home to the Howleton Estate offering artisan chocolate making – an unsurprisingly popular activity for the family boats on this year’s rally! Looking beyond their time in Saint Lucia, Caribbean cruising guru Chris Doyle has been giving talks for participants to help them plan their season’s sailing. Chris’s cruising guides have almost biblical status in the Caribbean for sailors and his enthusiasm for cruising the islands has inspired those attending his talks over the past two days. In fact, several ARC boats have already begun cruising to the nearby island of Martinique, before they plan to return for Saturday’s Prizegiving Ceremony. With 5 boats still to arrive, and plenty more activities on the social programme this week including tonight’s IGY Rodney Bay Marina Managers Cocktail Party and Thursday’s visit to the Anse La Raye Fish Fry, the ARC excitement is far from over in Saint Lucia.